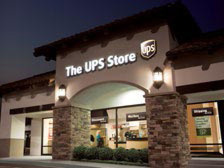 MORE ABOUT UPS Store: At The UPS Store(R), we do more than just shipping!!! We are your local support staff. Our range of products and services includes: Shipping: We deliver across the country and around the globe. We will do whatever it takes to get your shipment there on time and intact. Packaging: Shipping a musical instrument? Stereo equipment? TV? Computer? Surfboard? Or maybe an antique item? As the pack and ship experts, we will fit all your needs with our exclusive packaging services, such as customizing your oversized and/or odd-sized packages. Printing: We offer a wide range of printing services, including color copies, black and white copies, digital printing, binding, laminating, as well as paper and office supplies. Mailbox: You can get a mailbox with a real street address and secure 24-hour access. Additional products and services: Faxing, notary, passport/ID photos, postal services, rubber stamps, office and packing & mailing supplies, etc... So next time, when you are in need, whether for your business or personal needs, you will find it conveniently at our The UPS Store(R) in Peoples Plaza.